My Sweet Angel of Death, by Hilary Davidson, in Ellery Queen's Mystery Magazine, December 2014. The narrator of this story has just arrived in South America on a one-way ticket. We don't know her story at first, just that there is a tragedy in the background. Was she victim, villain, or something else? This is one of those stories that sneaks up on you. I like a story in which a character has a second chance, as happens here, but I had no idea it would be my best of the week until I got to one sentence that made my jaw drop. If I had come up with that bit of plot I would have spent at least a page on it; Davidson fires it off in ten well-chosen words. Hammett and Stark would be proud. "Disco Donna," by Shari Randall, in Chesapeake Crimes: Homicidal Holidays, edited by Donna Andrews, Barb Goffman, and Marcia Talley, Wildside Press, 2014. Following last week's grim story of a disappearing child in Sweden, here is a much lighter story of a murdered teenager in Maryland. Go figure. The narrator and her two friends are high school girls preparing to dress as hippies for Halloween. In a used clothing store they find a box of leftovers from Disco Donna, the town's legendary unsolved murder victim. (Her former home had just been renovated.) This leads to a second box that had been donated to the town library, and in that box they find a clue to the murderer. The main pleasure here is the language of the teenagers. People cracked. That happened on Lifetime all the time, too. We OMG'ed up the stairs. She reverted to Korean, which she did only when she was completely unhinged or in gym class. "Day and Night My Keeper Be," by Malin Persson Giolito, in A Darker Shade of Sweden, edited by John-Henri Holmberg, Grove-Atlantic, 2014. Sorry this review is late; I was at Bouchercon. Petra is a single mother and after a long December day is at the end of her rope, so she decides to take her children to the Christmas market. And - boom - her four-year-old daughter disappears. And the tension rockets. She presses a few buttons, shakes it, but it's pointless. Her daughter is gone and the phone won't ring and fear has to duck because now terror runs up her back, with sharp talons and pointed teeth. Evetually the cops arrive and Officer Helena Svensson becomes the viewpoint character. She is trying to lead the investigation, while judging whether Petra's reactions are normal -- and what's normal in a situation like this? And she is keenly aware that in Stockholm in December a child who falls asleep outside could die of exposure. At Bouchercon a panel was debating enthusiastically whether a crime story needed a surprise ending. This tale doesn't have one. It ends with the cop - and the reader - asking a set of plaintive questions. Not at all a standrad crime story, but a doozy nonetheless. And now: SPOILER ALERT: For some readers the death of a child is taboo, so: No childen die in this one. 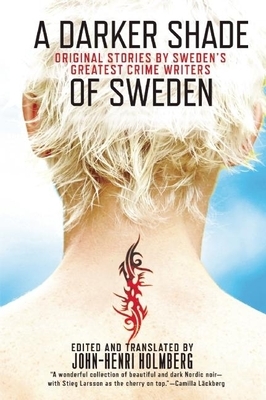 "An alibi for Señor Banegas," by Magnus Montelius, in A Darker Shade of Sweden, edited by John-Henri Holmberg, Grove-Atlantic, 2014. Funny story: when I heard about this book I went to a big ebook store to buy it. The store was convinced I wanted to buy a different book with shades in the title. Something about the color grey. Eventually we worked that out. The Swedes and I seem to have a disagreement about what constitutes a good ending. Several times I would be enjoying a story, thinking, this could be the best of the week, and then it would end and I would think, don't call us, we'll call you. That's not a problem with the story my Mr. Montelius. It is also the lightest story I have come across so far in this intentionally dark collection. That may have helped it in my evaluation. Adam works for a company that wants a contract from the Honduran government, and so he is playing host to an official, Señor Banegas, who is visiting Stockholm in December. The problem is, Banegas has fallen in love and wants to spend the week with his sweetheart, not his wife. To arrange that, he has created an elaborate schedule, supposedly Adam's work, that fills all of his daylight hours. But here's the catch. Banegas' wife is so suspicious - God knows why! - that she might well check up on him. So he wants Adam to tell his wife the same story, and stay away from home for most of Christmas week. An outrageous demand, but there is a twist - Adam is delighted to cooperate because his loathsome inlaws are visiting. He can slip away, claiming he is visitng Banegas, and spend the day in a museum or coffee shop, far from the annoying relatives. "Male Leary Comes Home," by Michael Guillebeau, in The Anthology of Cozy Noir, edited by Andrew MacRae, Dark House Books, 2014. First things first: I have a story of my own in this anthology, so that may affect my objectivity. 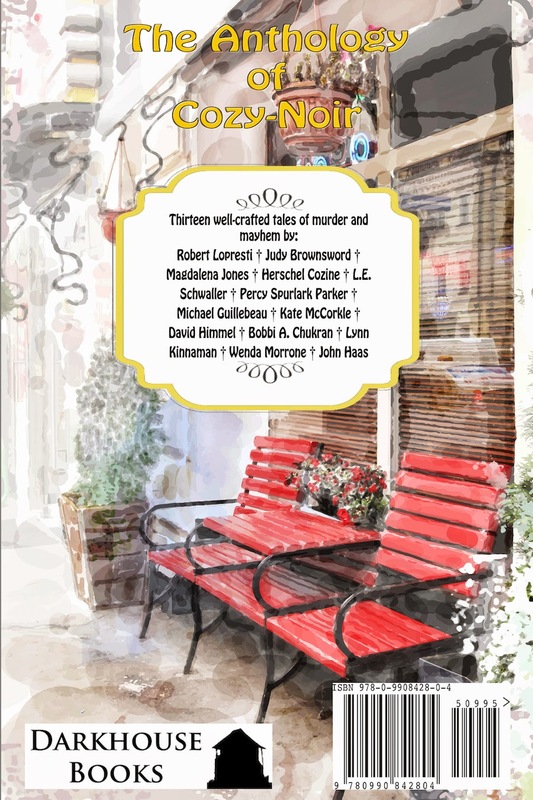 And let's talk about the theme of this anthology: what the heck is cozy noir? Besides an oxymoron, I mean. Cozy has been defined as "a mystery in which people get killed but no one gets hurt." Noir, as I said a few weeks ago, is fiction in which a nobody tries to be somebody and gets stomped for it. There isn't really much overlap between those two fields. Most of the authors I the book (so far as I have read) have interpreted it more or less this way: Something violent and nasty happens in a relatively idyllic place. Fair enough. We are almost to this story, the second by Mr. Guillebeau that has made my column this year. But first, we have to talk its subgenre. There are two ways to build a piece of historical fiction: external and internal. (They are not exclusive, by the way). External means you bury yourself in the details of the time and place you are writing about, so that the reader is convinced that you know (even if you don't tell) who built every conestoga wagon, Byzantine chariot, or Ford Flivver your characters rush to the rescue in. Internal means that you create characters who talk, speak (within reasonable limits) and most importantly, think like people of that time and place. That's much harder than figuring out what an eighteenth-century policeman would have had for breakfast. One reason it's hard is that, if we are honest, a lot of people in the past are going to have opinions we find unpleasant or unacceptable. Do you really want your protagonist to talk about African-Americans like a real cop in the forties might have done? And so you may get the feeling that under that Roman toga the hero is wearing modern Fruit-of-the-Looms. The reason I like this story so much is that (while it is not offensive to modern eyes) it reads like the author grew up on Black Mask magazines, fought in World War II, and came back to write about what he found at home. Which brings us to the Leary guy in the title. He was baptized Robert T. His birth certificate calls him Male. His friends call him Mister. Under any name, he was in the Navy during the War and then joined the merchant marine. When the story opens he's back from sea and learns that the father of his girlfriend is having trouble with a gang boss. Leary and a friendly bar owner get involved and - something violent and nasty happens in a relatively idyllic place.. The last few paragraphs, with Hammett-esque irony, illustrate the cozy-noir theme so well that they might have been written with this book in mind. In any case, the story is a treat. Robert Mangeot - Turner of Phrase. Counter of Beans. Crafter of Sandwiches. Come See Me at ICFA! The Westlake Review | Reviewing every book Donald Westlake ever wrote. Because I can. Lohnt sich ein teurer Haartrockner? Auf diese 8 Kriterien müssen Sie achten!